TLS performs a total-line-shape analyses (deconvolution) of any spectra, with special emphasis on NMR spectra though. Intensities, frequencies, line-with(s), line-shapes (Gaussian/Lorentzian, dispersion, asymmetry) are iteratively fitted including a baseline with up to 20 Fourier and 20 Polynomial terms. The present algorithm allows the use of almost any 'prior knowledge' in the analysis. For example, different multiplet structures can be defined. Lines can also grouped into complexes and structures. TLS gives nonbiased error estimates for the total area of the group. 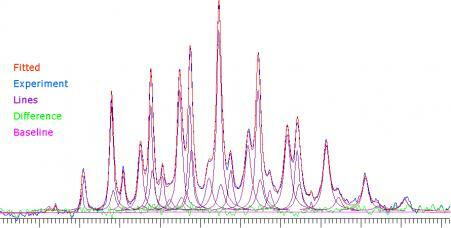 TLS can also be used to prepare NMR spectra for spectral analyses. The subtract-feature is very useful, for example, to remove overlapping solvent or impurity signals.